Montreal got hit with a bad case of the Mondays, as a layer of freezing rain came cascading down on the city beginning on Sunday night and continuing well into the morning. Snow and ice pellets began falling on the southern portion of Quebec on Sunday evening. Between 10 and 20 millimetres of freezing precipitation are expected to fall by Monday evening. Environment Canada warned that the rush hour commute on Monday morning could be hazardous, with slippery roads, highways and sidewalks, as well as possible falling tree branches. In Montreal, just over 400 Hydro Quebec clients are without power, but other regions have been harder hit. 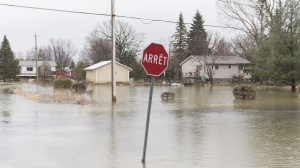 Over 31,000 customers are without power in the Outaouais region, while another 3,500 are affected in Monteregie and 1,300 more in the Laurentians. Numerous flights arriving and departing Trudeau Airport have been either cancelled or delayed. To check a flight's status, click here. The City of Montreal began preparing to distribute salt on the city's roadways on Sunday in advance of the freezing rain. The freezing rain comes along with an early Spring cold snap, with temperatures topping out at 3 Celsius on Monday. Regular rain is forecasted to fall throughout the week before sunny weather with temperatures in the double digits over the weekend. In Ontario, thousands of Hydro One customers are without power as of Monday morning due to freezing rain.